Banks from the US are boosting their lending again, but European banks are not. The global banking system has partially recovered from the financial crisis, but large segments remain dysfunctional. The collapse of Banco Espírito Santo in Portugal was a shocking reminder that the system is fragile and there is little room for complacency. Nevertheless, there are plenty of examples of banks in all parts of the world that have excelled in meeting the needs of their customers over the past year. Banks in the US increased their lending in the second quarter of 2014 at the fastest pace since the financial crisis, according to the Federal Deposit Insurance Corporation. The level of US bank lending topped $8 trillion for the first time ever. Meanwhile, lending to the private sector by banks in the eurozone has continued to fall. In July bank lending declined by 1.6% on a year-over-year basis, the European Central Bank reported. Results of the ECB’s yearlong asset quality review and stress test are due this month. “All signs point to the tough times continuing for many banks, particularly for those that are internationally active and complex,” says Stefan Best, Standard & Poor’s credit analyst. New regulatory and legislative initiatives are pushing up banks’ compliance costs and restricting revenue growth, he wrote in a recent issue of S&P’s CreditWeek. Banks have stopped their proprietary trading and shrunk their private equity and commodities businesses, Best says. In addition, product margins will shrink through standardization and commoditization to allow for use of central counterparties for clearing, Best says. Banks’ operating, litigation and compliance costs are rising at the same time banks are facing limited opportunities of revenue increases from lackluster economies, he says. Bank lending conditions in emerging markets eased in the second quarter of 2014 for the first time since early 2013, according to the Institute of International Finance (IIF), which surveyed 132 banks from emerging economies. While these banks reported a marked improvement in funding conditions and expansion in loan demand, they continued tightening credit standards as nonperforming loans continued to rise. “Notably, both domestic and international funding conditions improved after being tightened sharply since the second quarter of 2013, when markets became concerned about the path of the Federal Reserve’s exit from QE [quantitative easing], with EM[emerging markets] Europe being a particular beneficiary,” the IIF says. While EM Europe saw a significant improvement in lending conditions, there was a further deterioration in lending conditions in Latin America. The Middle East and North Africa continued to have the most favorable bank lending conditions, compared with other EM regions. The takedown at the ECB’s inaugural auction in September of targeted longer-term refinancing operations (TLTRO) was only $107 billion of four-year loans, far less than many analysts had expected. Marc Chandler, global head of currency strategy at Brown Brothers Harriman, says: “Generally speaking, while many are saying the program is a failure, others, including ourselves, want to reserve judgment until the December offering.” September was the first of eight TLTRO auctions that will be held by June 2016. Meanwhile, the Bank of England, which pumped more than $600 billion of stimulus funds into the UK financial system through its bond-buying program, which began in 2009 at the height of the British recession, released research showing that the effort failed to increase bank lending. Nevertheless, the program did boost aggregate demand and inflation, the UK central bank says. The BofE says its experience with quantitative easing would not necessarily be repeated in other countries. In addition to loans, corporations rely on banks for critical investment banking and transaction services. Treasury and trade solutions have been less affected by new capital requirements, although they require heavy investments in technology to remain best in class. In investment banking, low volatility in the second quarter of 2014 hurt trading income, although mergers and acquisitions remained strong. Banks around the world remain highly vulnerable to legal and conduct-related risk, according to EY’s review of key themes discussed in earnings conference calls in the second quarter. Fines related to legacy issues remain a significant headwind, EY (formerly known as Ernst & Young) says. “Uncertainties related to the size and timing of fines are significant, and as regulators continue to launch new investigations into such issues as currency manipulation and high-frequency trading, it is difficult for most banks to foresee the end of legal headwinds,” EY says. Banks’ returns on equity reflect an ongoing drag from legacy issues and settlements with authorities, EY says. “Faced with lackluster revenue prospects, banks must find ways to achieve material cost reduction if they wish to generate better ROE performance,” according to EY. The firm found little evidence, however, that banks are planning to launch new expense-reduction plans. Six years after the global financial crisis sparked a wave of unprecedented regulatory reform, many rules have yet to be finalized, EY says. As banks continue to build capital levels, they face significant uncertainties surrounding leverage ratios, qualifying capital instruments, and buffers for national and global systemically important banks, it adds. 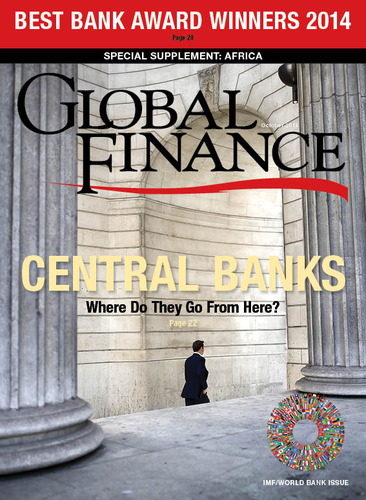 In our 21st annual survey, Global Finance has selected the best banks in 150 countries and eight regions of the world. 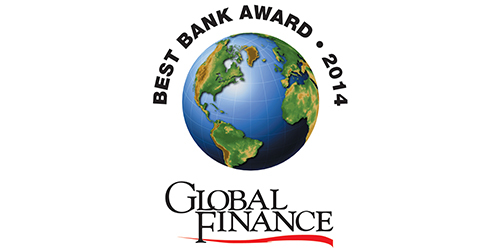 We also identify the best global banks in 14 service categories. The winners are not necessarily the biggest banks but, rather, the best banks—those with the qualities corporations should look for when choosing a bank. These banks offer the most-effective risk-management systems, the best products and outstanding customer service. We have selected the winners based on performance over the past year, as well as subjective criteria, including reputation and management excellence. Global Finance made the selections after extensive consultations with bankers, corporate financial executives and analysts worldwide.